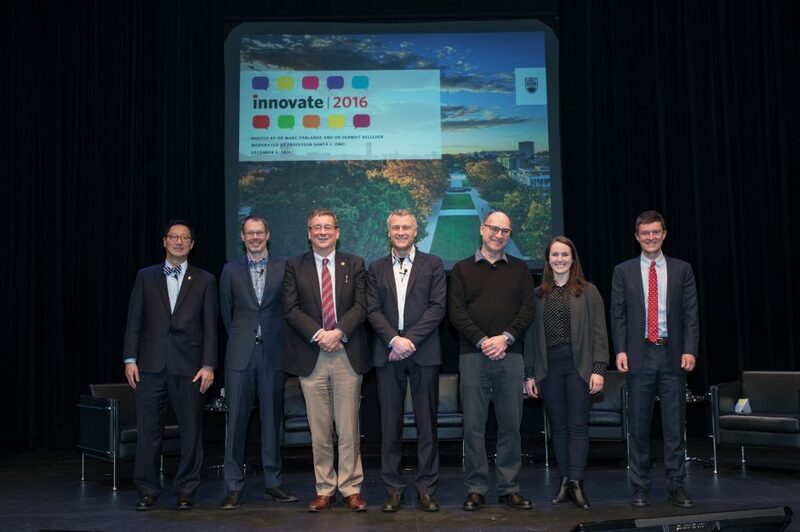 Andrea Palmer stands with UBC President Santa Ono, Dean Marc Parlange, and other Innovate 2016 presenters. On Tuesday, December 2016, UBC Applied Science held the third annual Innovate, a dialogue series that brings applied research to the community and provides a pathway for industry partnerships. This year’s event was co-hosted by the Faculty of Medicine, who highlighted stories of UBC-linked startups with biomedical engineering roots. Among this year’s five presenters was MECH alumna Andrea Palmer, founder and CEO of Awake Labs. In her presentation, Andrea discussed the work currently being done at Awake Labs. An autism health company that is committed to empowering those living on the autism spectrum, her company is responsible for the development of Reveal, a wearable that measures and tracks physiological signals in real time to help autistic people and their caregivers understand changes in behaviour. For more about this year’s Innovate, please visit Innovate 2016.